Quick summary: Students are asked to measure the perimeter and area of a range of garden bed shapes (parallelograms, triangles and composite shapes). They are also asked to explore how these shapes affect the materials required for creating garden beds and the number of vegetables that can be planted. As a result of this activity students are encouraged to apply their learning and build a garden of their own. Students use perimeter and area to measure parallelograms, triangles and composite shapes. Students use knowledge of vegetables to (theoretically) plant out their garden beds. Level of teacher scaffolding: Medium- teacher will need to demonstrate basic geometry on the board. Resources required: Student Worksheet, rulers, graph paper. Homework and extension opportunities: Students can create a garden bed and plant it out with vegetables. They can also price soil and wood and find out the amount and cost of materials required for the vegetable patch they have created. Key words: Mathematics, garden, garden bed, perimeter, area, volume, geometry. Students use the creation of garden beds and the growing of vegetables to explore the perimeter and area of parallelograms, triangles and composite shapes. Students are asked to explore a range of garden bed shapes, and how these shapes affect the materials required for creating the garden beds and the number of vegetables that can be planted. Food and water are essential to our survival. 50,000 years ago, when we were dashing about the savannahs and forests, humans hunted and gathered their food. Now things have changed. We don’t catch our food anymore; it comes to us in nice-looking processed packages. We are told that this packaging and processing makes it easier for us to eat and that it is better for us. Who are we kidding? It usually just means that it’s got stuff in it that’s bad for us, and that it’s wrapped in something that’s bad for our environment. Thought starter: Do you know where the ingredients that make up a packet of chips come from? Food and water is essential to our survival. 50,000 years ago, when we were dashing about the savannahs and forests, humans hunted and gathered their food. Now things have changed. We don’t catch our food anymore; it comes to us in nice-looking processed packages. Food is best for you when you know the ingredients and it is grown locally. Most processed food (stuff that comes in a wrapper, bottle, package or box) contains things that no one can pronounce let alone knows the origins of. This is why growing your own vegetables is such a great idea! 1. 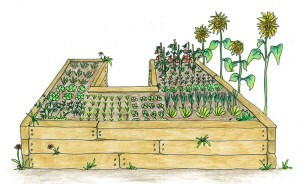 Jack, Sean and Emma are building a vegetable patch each (see diagrams below) in their backyard. Calculate the amount of wood that would be required to surround each person's vegetable patch (show your workings).